Black Ace Hook Chain Sprockets are manufactured with the highest integrity. 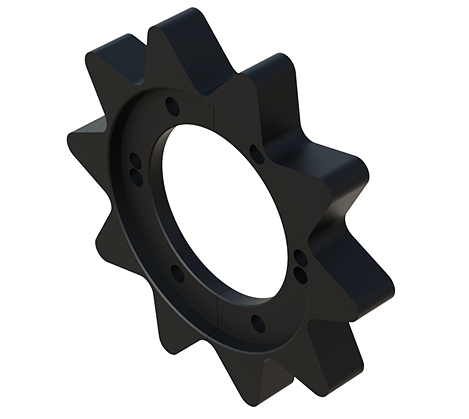 You will realize value, as these sprockets are flame-cut and machined with the highest precision available on the market. Torch Profiles – Engineered to promote the best life for your sprockets and chain, Black Ace Steel Cut sprockets maintain better pitch accuracy and perpendicularity over cast iron. This means longer sprocket and chain life. A Type (no hub) typically used in weld-on applications. Split Style Construction (hub on one side) – Once you use a Split Sprocket, you may never want to use a setscrew mount style again. Removal or installation is a breeze. Can be used in virtually all applications. An additional benefit to Black Ace’s split sprockets is that the shaft/keyway security is much tighter than a typical setscrew mount. Idler Style – Assembled with long-lasting Black Ace Ball Bearings. Multiple Sprocket Thicknesses Available – Standard Sprocket thickness is 1", but some circumstances may require different thicknesses. Thicknesses are available from ½" to 2". Heat Treat – Hardening of sprockets is available as an option. Hardness on hardened sprockets ranges from 50-60 Rc. Please customize all of the custom detail options in order to receive information about a specific sprocket. Keyway Size: 1/8" 3/16" 1/4" 5/16" 3/8" 1/2"